As some of you already know, I've created a new category for Salutor.com that will in some ways function as its own blog: Cyril's Gleans. Cyril (aka "George Cyril Wellbeloved" or "Cyril of the Valley") is an individual I sometimes describe as the world's greatest blogger-without-a-blog. He is, among other things, the most ravenous reader I know and has long been the source of many of the interesting articles I run across on the web (when I have time to look through them). Because he has never shown any particular interest in publishing his own blog, I plan to try to re-post at least a portion of the daily gleans he sends in the Cyril's Gleans category of this blog. These entries will not appear on the home page of Salutor, but will reside on the web where they can easily be searched or perused at will. As always, Cyril, thanks for all the great gleans! Well, I've spent a few hours mucking about with the formatting of Salutor, and it is making some progress. Problems remain, however. 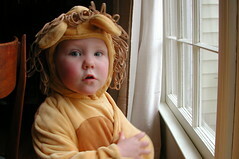 In the meantime please enjoy this photo of my daughter Lula in her lion costume. If you are one of the stalwart souls who once subscribed to Tenebris, I'd like to thank you and once again to beg your forgiveness for having provided such an inconsistant resource. It's worth noting that Lulu, a company I spent four years helping build before leaving at the end of September, still has an official blog, and that the self-publishing forum I started in Google Groups now has a real administrator in the (very good) person of Dehanna Bailee.